The dog days of summer are right around the corner! Kick off summer's official start with an outdoor yoga class in Tremont’s Lincoln Park. 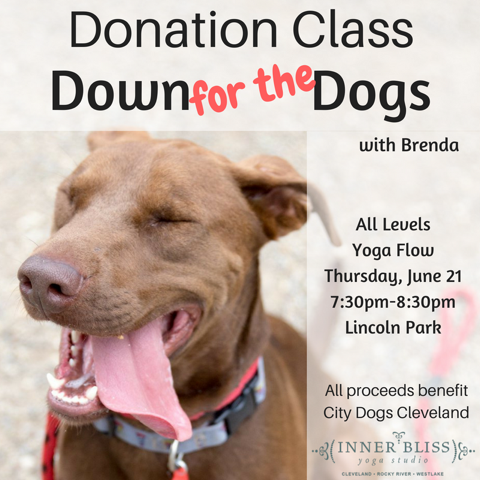 Join Brenda for an all levels vinyasa class benefitting City Dogs Cleveland. Arrive at 7pm for day-of registration or to simply mix and mingle with some adoptable dogs. Stick around for class from 7:30pm-8:30pm and learn how to perfect your down dog from the pros. City Dogs Cleveland is the volunteer-led program of the City of Cleveland's Division of Animal Care & Control. A donation of $10 is suggested, but please just give what you can. All of the proceeds will go directly to helping the pups at City Dogs. Bring your own mat and maybe a towel to wipe off the sweat and slobbery puppy kisses.